New to all of this so please treat me kindly. I have downloaded the M5 Burner, but the only firmware options I have is for the stick. I need the M5 Cam firmware. Can anybody please advise? Never loads any other versions of firmware other than the ones listed above. the windows link i posted is the uiflow firmware loader but it has the camera firmware in the package. So which one do I choose please? I do believe the fisheye also uses the M5Cam-psram firmware. I have UIFLow-v 1.2.3-en loaded and I have setup an IP address but nothing is loading. The options I have are on the image I loaded - I see no cam0.02? @gachapo There should be an option in the top dropdown box to select it. 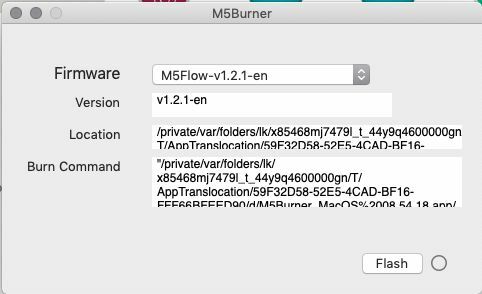 Click on the M5Flow-v1.2.1-en and a box will drop down, scroll through the list and the cam firmware is near the top. That's my point - there's nothing more than the image I sent. The only choices I have are on the left and the only drop down boxes are at the top and relate to the COM port and Baud rate?? Sorry No image has appeared. Um, something is not quite correct there! An alternative is that you can download the source code and compile it yourself. I could, if I knew how. I was hoping somebody would know why I cant use the burner? @watson Thanks for coming back to me. I have downloaded the new version and I have tried all three versions of cam software. None of them go into AP mode so I can browse to them. I have the Camera without the case so can you please let me know which software I use and how I get it sdet up beyond download. @gachapo Download a new one from www.m5stack.com, then burn ESP32CAM-v1.0.0. Your board is named ESP32CAM. Here's the doc for it. That's great thank you - works. Is there any documentation about how to assign your own IP address to the camera please? @gachapo Do you mean this doc?